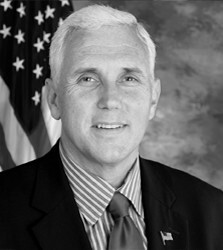 Mike Pence (R) is the current sitting governor of Indiana and former member of Congress from Indiana. He has earned a reputation as a conservative politician who is enacting many policy reforms conservatives have long favored. Formerly the head of a free-market think tank focused on Indiana policy, Pence is capable of understanding and communicating regarding policy details. His twelve years in Congress include leadership of the Republican House Study Committee, a group focused on advocating for smaller government and free markets, among other conservative positions. As governor Pence has implemented an aggressive policy reform agenda that is largely consistent with his voting record in Congress. He cut taxes and expanded school choices programs in his state, but he has also expanded Medicaid under Obamacare, something many conservatives are likely to be unhappy about. Aside from this one departure from conservative views, however, Pence seems to be a reliable ally of the limited government movement. Pence is not a household name, and he is not the only Republican governor pushing a conservative reform agenda. But he is respected by many around the country for his mostly consistent adherence to conservative principles and has built an admirable track record over fourteen years in public office, and he could become a serious contender for the Republican nomination in 2016. Mike Pence was born in Columbus, Indiana and graduated from Hanover College in 1981.1 He worked at the college as an admissions counselor until 1983. He then attended Indiana University School of Law in 1986, earning his J.D. from the school. In 2000 he ran for the congressional seat then held by David McIntosh, who opted to run for governor instead. Pence was elected, and held the seat through 2012 when he successfully ran for governor of Indiana. He was sworn in as governor in January, 2013. His voting record was consistently conservative throughout his time as a Congressman, although his tenure as governor suggests a shift or compromise on the issue of Medicaid expansion. Like every other Republican in Congress Pence voted against Obamacare. Pence recently announced Indiana would participate in the voluntary expansion of Medicaid that is part of Obamacare. The deal Pence struck with the Obama administration to expand Medicaid includes some market-oriented elements, but most conservative and free-market health policy experts argue Pence is simply expanding a failed welfare program. He has followed through on one of his main campaign pledges for governor, getting tax cuts pushed through the Indiana legislature. Pence’s time in Congress was largely uneventful and without personal scandal. However, in 2013, the governor’s staff was found to be removing content from his Facebook page from followers who opposed him on certain issues. The Governor issued an apology and the users whose comments were deleted were unblocked from the page 9. While a strong conservative and one who is generally well liked by those who know him, he does not have the same kind of national ID that other potential candidates do. Governor Pence (and in his role as Congressman Pence) has received many awards from leading conservative organizations throughout his career. In 2005, he was named “Man of the Year” by the conservative publication, Human Events. He’s also received the “Taxpayers’ Friend Award” from the National Taxpayers Union, the “Taxpayer Super Hero” award from Citizens Against Government Waste, the “Friend of the Family” award by the Indiana Family Institute, and the “Distinguished Christian Statesmanship Award” by the Center for Christian Statesmanship. He’s also been recognized by the Inland Press Association for his work in defense of free speech. As governor, Pence has not signed the American’s for Tax Reform “No New Taxes” pledge,10 but did so as a congressman.11 In 2007, the London Daily Telegraph named him one of the Top 20 Most Influential Conservatives in America.12 Pence is very clearly considered a leader in the conservative movement. His signature achievement has been to push tax cuts through the Indiana legislature, although he was unable to persuade the legislature to cut them as much as he asked. While in Congress, Pence led the House Republican Study Committee,13 an influential group of conservative House Republicans, and was elected by his peers to serve as the Republican Conference Chairman,14 all suggesting Pence has enjoyed the confidence of his peers in terms of his leadership skills. During the Bush Administration, Pence voted in favor of giving the president fast track authority to negotiate trade agreements58. He also voted in favor of trade agreements with Chile59, Singapore60, Oman61, Peru62, Korea63, Panama64, and Columbia65. And, he also supported CAFTA, the Central American Free Trade Agreement66. In 2002, Pence voted in favor of a bill that increased farm subsidies75 but later, in 2008, voted against the extension of the bill stating it didn’t reform the subsidies to make farmers less reliant on government76. Governor Pence has an advantage over other sitting or former governors who have their sights set on a presidential run in 2016. During his time in Congress, Pence sat on the House Foreign Relations Committee82. Since assuming the governor’s office in 2013, Pence has made three trips overseas – first to Japan and more recently, Germany – including a stop at the Ramstein U.S. Air Force base83 as well as a more recent trip in December 2014 to Israel with his family84. Overseas trips like these are often part of a serious presidential contender’s agenda while preparing for a possible run. For those who believe that a strong and well-funded U.S. military is key to their next candidate, Governor Pence is one who seems to rise to the top in this area. The Washington Post even noted that, “Pence more than other governors is well versed in national security matters from his decade in Congress including service on the House Foreign Affairs Committee.”85 As recently as 2011, then Congressman Pence voted against the reduction of Navy and Air Force appropriations86 . Pence did not support the deployment of ground troops to Libya92. Since assuming the governor’s office in 2013, Pence has made three trips overseas – first to Japan and more recently, Germany – including a stop at the Ramstein U.S. Air Force base93 as well as a more recent trip in December 2014 to Israel with his family94. As congressman he voted against President Bush’s “No Child Left Behind” Act101. Pernce’s wife’s charity, “Indiana First Lady’s Charitable Foundation,” could raise eyebrows on the campaign trail. The organization was founded shortly after Pence was elected to office and it is very broad. As of January 20, 2015, neither Guidestar or the Foundation Center websites have records of the organization’s IRS form 990s. It would be easy for any opponent to question whether the organization is simply a political patronage vehicle for special interests to garner favor with the Governor.